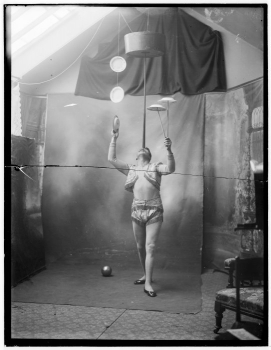 a German music hall entertainer whose speciality juggling act made him popular in the English music halls during the 19th and early 20th century. Cinquevalli first appeared in England in 1885 with much success and settled in London, appearing in various circuses, music halls and pantomimes. In 1912, he became one of the first acts to appear in music hall's first Royal Command Performance. He is perhaps best known for being one of the first "gentleman jugglers", a description given to a male performer who juggles with everyday objects such as bottles, plates, glasses and umbrellas.